It was the best joke. Because people expect jokes from Aziz Ansari and Ricky Gervais and Will Ferrell. Even from Amy Schumer. But they don’t expect jokes from ‘straight’ actresses, and that’s why it was so great to hear Eva and America point out that they were neither Gina nor Eva (Mendes) nor Rosario, but that they were possibly either Salma or Charo. Humour is incredibly powerful. Fighting stuff like this with humour is often the only way anyone listens and pays attention. 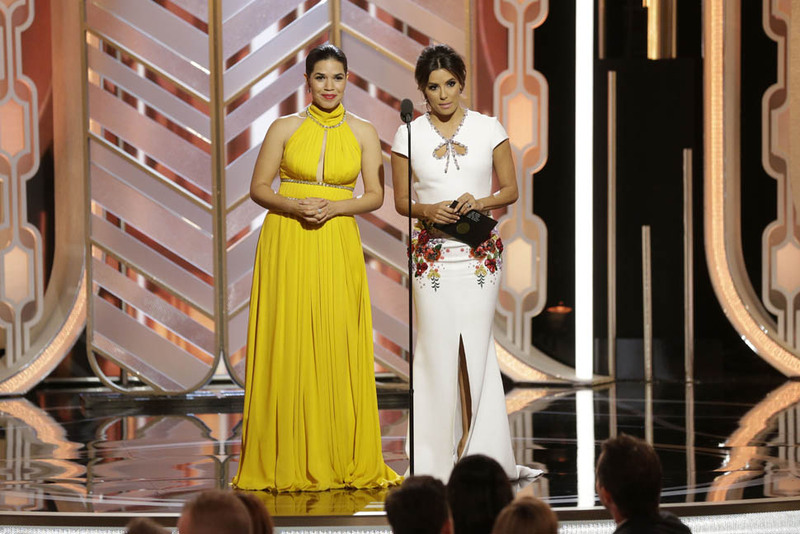 Maybe we’ll be spared America being confused with JLO, since two Latina women wore the same mustard-yellow colour. While we’re on the dresses – I loved Longoria’s. I would have loved to see it more, though I don’t know if it would work on someone who was less petite. It seems engineered for someone short. America’s look didn’t work as well for me, though. The problem with trapping your neck in a collar is that you logically want to get your hair out of the way so that your face isn’t floating alone, but then pulling it back looks harsh, and there’s no softness to any of the outfit. I’m never an expert on updos, but pulling it back softly might have made the whole thing gel more. Maybe.